History of Greek Philosophy is an immense work in two volumes about ancient Greek philosophy. It (Philosophie der Griechen) was written in German by Dr. E. Zeller a professor at the University of Berlin, this is the English translation published in England in 1881. 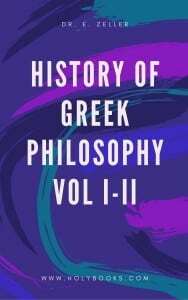 The work is one of the most successful and ambitious attempts at dealing with the entire Greek philosophical tradition as a whole. The authors general idea is that Greek philosophy gains immeasurably by being studied in the order of its development. The first chapters discusses the sources of Greek philosophy and the connections to the Orient. Before the chronological examination of the single periods of time and the major Greek philosophers we are also given lectures on the ethics of the early Greek societies and the basic cosmological understanding in ancient Greece. I am sorry that the scannings are of such low quality.